How do you say FABULOUS in dog language? Finally, an event that combines everything we love: booze, doggies, philanthropy and a costume contest. About damn time. Dogcentric, a local dog-walking service, is hosting the Canine Happy Hour and Costume Contest (6:30-8:30 p.m. tonight) at Tommy Joe's (4714 Montgomery Lane, Bethesda). The spot has a patio with outdoor heaters, perfect for a meeting of the fur babies. The costume contest will start promptly at 7:30 p.m., with dog treats to be provided. Human treats (including drinks) will be on special all night. Feel free to stick around after the contest for a hauntingly good time with people who are "creepily" fanatical about their canines. This event will be held rain or shine, and all dogs must have current shots and be kept on leashes. The event is cash-only, but all proceeds go to the Washington Animal Rescue League. 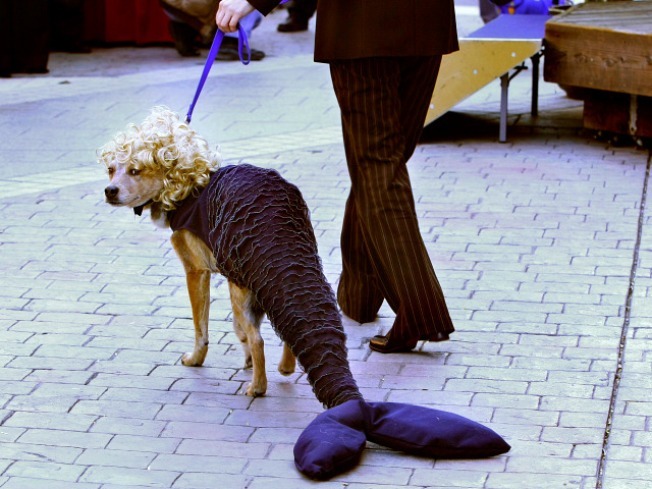 Psst... Are you dressing up your dog (or yourself)? Post your costume pics on So Washington!